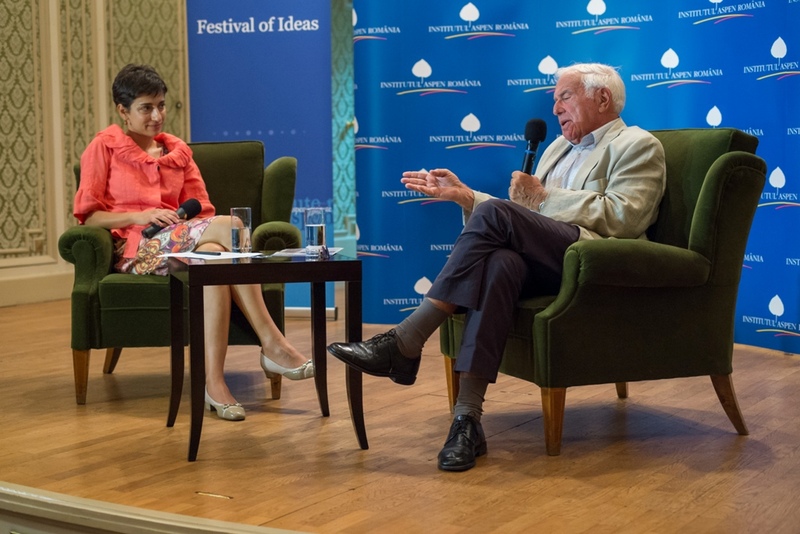 The second event of the 2013 Festival of Ideas was a Conversation with Ioan Holender, artistic director of the “George Enescu Music Festival” on cultural management, identity and the transformative power of music, on Thursday, September 12. Mr. Holender was appointed in 1988 General Secretary of the Vienna State Opera and the Vienna Volksoper, and in 1992 General Manager of both Opera Houses. His contract in Vienna ran until the year 2010, and he is the Vienna State Opera’s longest serving director since 1869. Nowadays he is advisor of the Metropolitan Opera New York and the Spring Festival Tokyo and artistic director of the George Enescu Festival Bucharest. He is a lecturer at the University of Vienna and at the Danube University Krems. Further he is a jury member for several international singing-competitions. He has received five honorary doctorates and is a recipient of the Decoration of Honour for Services to the Republic of Austria and the Medal for meritorious service to the State of Vienna, as well as the Austrian Cross of Honour for Science and Art I. Class. In 1999 he was appointed “Officier de L’Ordre des Arts et des Lettres” by the French Republic. He has been decorated with the most important Romanian medal. In December 2002 he received the Grand Decoration of Honour for Services to the Republic of Austria. Further he received the Grand Decoration of Honour in Gold of the Italian Republic in June 2004 and with this has been appointed “Commendatore”. In May 2005 he was awarded the „Europäischer Kultur Initiativ Preis” of the European Foundation for Culture Pro Europa. He also holds the Goldenes Verdienstkreuz des Verdienstordens der Bundesrepublik Deutschland and the japanese “Orden der Aufgehenden Sonne am Halsband, goldene Strahlen”. Other topics of conversation will cover how festivals and other artistic events serve as means of bridging cultures and Romania’s way of promoting its traditions, arts and cultures. We will also look at how a country can benefit from promoting its culture and traditions, analyzing as well ways in which Bucharest and other major Romanian cities can create a cultural hub for the region. In partnership with the George Enescu Festival and with the support of the Aspen Institute’s Ideas Festival, this event will invite participants to engage in deep and meaningful discussions on the overlaps between social identity, success in the arts and culture and how these can serve as identity pillars. We will also discuss how we can better promote culture and the arts and provide to the public at large, in order to enrich people both culturally and spiritually.